Delaware’s Senior Senator, Thomas R. Carper has long had a passion for helping small businesses grow and thrive. Throughout his career in public service, he has been a staunch supporter of initiatives to support small businesses. “One of the best parts of my job as a Senator is getting to meet regularly with my constituents to hear about the issues that are important to them and how I can be helpful,” Carper says. It’s easy to see that he enjoys conversing with local business leaders about the challenges they face and is in support of policies that stimulate business growth and job creation in the U.S. 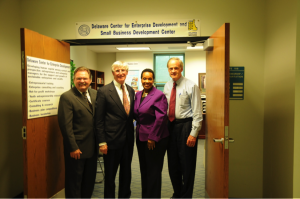 Most recently, Carper spent time in Dover with the SBDC and Delaware State University’s Center for Enterprise Development (DCED) to learn about business resources available to Kent County and to find out what his office can do to support their growth.